2018 Ruby on Rails Salary Report: How Much Do RoR Developers Earn? Business across the world depends on IT talents that support a bunch of technology enterprises. Many companies find it challenging to accomplish the staffing of development and tech departments. The main reason for that is the lack of professional staff for immediate hire. Recruiters have to search for the skilled candidates that are usually hired at once they enter the market. Today, IT specialists keep options open on several employers and job offers. In spite of a great number of incentives and bonuses, salaries keep being one of the key governing factors while accepting a job offer. Below is one of our pay surveys. Today we will talk about Ruby on Rails salary. Fast development. The development time with RoR is 40-50% less as compared with other programming languages. Flexibility. The modular structure of RoR adds value. The solutions can be easily modified, enhanced, or extended after the deployment. Inheritance. Ruby is defined as the sequence in structure and methodology while writing code on RoR. Cost-effectiveness. The three aspects above lead to the reduction of costs and increase ROI significantly. Performance. RoR applications run not so fast as the applications written in Java or C.
Servers. The cost of servers for the beginners is rather high. Here is our visual aid that demonstrated all the advantages of using RoR for your IT projects. With lots of advantages, Ruby on Rails is one of the popular programming languages for study. It is easy to learn, simple to code with, that’s why RoR becomes the number-one pick among some other languages. Obviously, rates and costs of RoR development seem to appeal to many fledgling developers. When we conduct our research on developers costs and salaries we try to acquire data from trusted resources of different countries. Salary information from different countries of the world will help RoR developers compare and contrast the payments they get from their employers. Besides, this information will also come in handy to employers as they focus greatly on market pays while hiring new people to their teams. 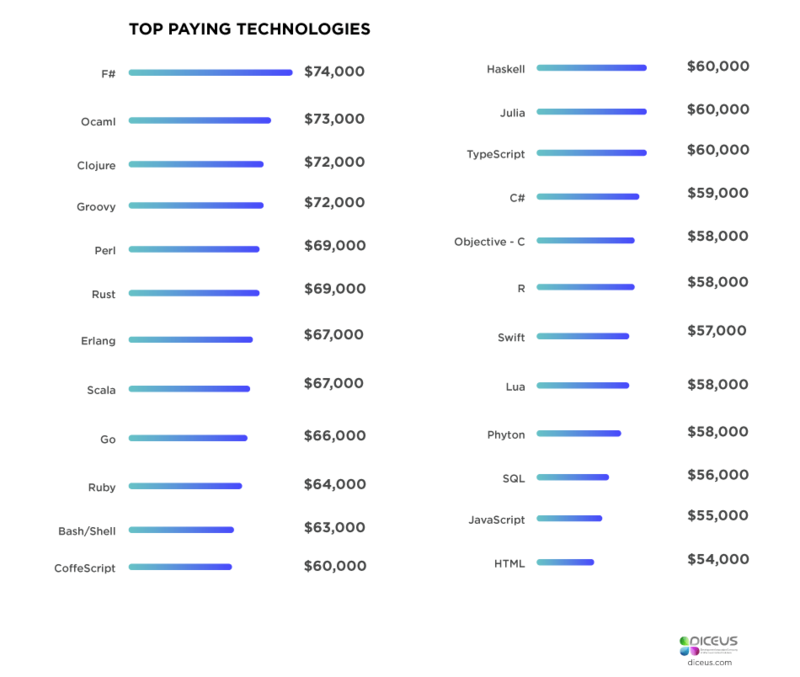 First off, take a look at the list of top paying technologies in 2018, the data is based on the fresh Stack Overflow survey. We see that Ruby stands 10 in the list of global pay data with an average pay of $64,000. According to Payscale, RoR developer salary is presented by jobs and depends greatly on what type of work a developer does and what expertise he has. Based on this criteria, we see that Senior software engineers get the highest median pay that is around $118,000 per year with approximately $60 during an average hour. Juniors and Middle developers earn less - $23-36 hourly. The range of pays varies between $41,000 and $153,000 per year. The similar data on wages is introduced by Simplyhired. They state that the average pay for RoR jobs is $120,000 per year. According to the site, popular companies looking for Ruby on Rails developers include LaunchCode, Amazon, GitLab, etc. The most reported RoR salary according to Indeed is $123,000 per year. Based on Indeed, the range of pays is rather high than Payscale shows - between $53,000 and $220,000. 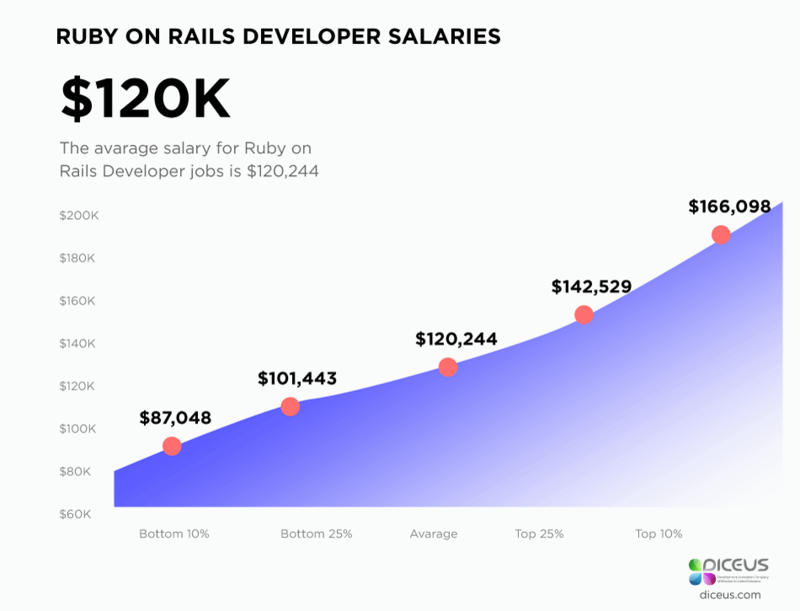 Glassdoor, another trusted source, states that Ruby on Rails developers make $74,500 per year on average with the range between $12,000 and $91,000. 68 reporting to Payscale show that the average salary of developer writing code in this language is 46,000 euro per year. The range is between 31,000 and 61,000 euro yearly. It’s quite difficult to compare the salaries in Germany and the USA as the economies and cultures tend to be different that’s why we will proceed to another European country. According to the fresh data on Payscale, RoR developers from the Netherlands earn from 21,000 to 69,000 euro per year. Their pay depends on the level of expertise and experience in the domain. So, Sr. software developers earn more (58-69,000 euro) than jr. or mid-level programmers (21-41,000 euro). It is considered that costs for software development in Eastern Europe are lower than in other parts of the globe. That’s why we decided to provide a comprehensive survey on RoR salaries in one of the most attractive outsourcing destinations, Ukraine. We used dou.ua data to provide you the recent salaries of Ukrainian developers writing code in Ruby on Rails. That is a short list we found in the job ads of one Ukrainian software company. These requirements depend on a company’s needs and goals that are usually interconnected with the project requirements. That’s why to successfully attract the most talented developers you should know all the details of your project, the required stacks, skills, and technologies to be used. According to Payscale, the median payment for RoR jobs is around $5,500 per year. The data is based on 121 individual reportings. The rates in India are obviously very low. However, if you are going to recruit developers from India, take a look at our article on this topic: “Differences Between Outsourcing to India and Ukraine”. Over the past 10 years, the salaries of developers have evolved greatly. Programmers have faced an across-the-board increase in payment for super talented individuals and people involved in the industry for more than 5 years. Let’s find out what other factors affect wages of people engaged in IT industry. Typically, the larger experience of a software developer is the higher you will pay for the services. Pay attention to that experience which is specific and fits your search. It is well-known that a developer’s education is not as important as the level of expertise is. However, qualified candidates can cost more than those who have no education at all. When it comes to paying increase or bonuses, employers may refer to the worker’s productivity as the determinative factor to measure performance. A friendly atmosphere is very important in software development companies as dedicated teams should be able to manage conflicts and commit to mutual goals. The higher your position is the more people you manage, the larger your pay should be. Regular reports on workflow and progress draw employers attention and increase trust to technical leaders. If you hire a developer for a full-time position you must know about all additional costs depending on the engagement model offered to you. You will definitely pay for overtime work or some additional services. Professional certificates give credit to developers working remotely like freelancer or as a part of a dedicated team. The candidates with certificates can ask for higher pay. That is the last factor from our list that may seem a minor one. However, some developers ask for additional pay if they use some specific hardware or software, subscriptions, or licenses to successfully work on the ongoing project. Before hiring any developer make sure you know all the pitfalls and extra expenses. Just ask all your candidates about the estimations, certificates, engagement models, and so on. You will definitely get the answers to your questions. How to Find a Software Development Company on Clutch? Feel free to ask any questions concerning outstaffing or outsourcing. Our experts will gladly give you the required recommendations. We have talked enough about the tips for choosing the best candidates. Now, let’s proceed to you, developers! Here are simple things you should know about to stay in demand, things companies can afford to you, beyond money. Incentive 1 - Work-from-home arrangements. Many IT professionals, especially those working in areas where long commutes undermine work-life balance, seek the opportunity to telecommute. If remote work isn’t an option, consider offering flexible schedules. Incentive 2 - The opportunity to contribute to multiple projects. Most talented tech professionals don’t want to be tied to just one type of work. Allow them to lend their expertise to various initiatives that interest them so they can build on existing skills and develop new ones. Incentive 3 - The ability to innovate. Encourage IT workers to propose new ideas and take the lead on developing solutions that help the company operate more efficiently. Empowering team members to take the initiative on business-critical tasks will only strengthen their loyalty. Incentive 4 - A clear path of development. Starting at the job interview, show in-demand technology candidates how they can grow with, and ascend in, the organization over the long term. Take into account aspiring managers and non-managers alike, and assure team members that their career path is a priority. We hope that Diceus Ruby On Rails salary report will help you figure out what things affect the pay, what incentives you could get from companies if you are a developer, and what skills you should look for if you are a recruiter. Follow our articles to search for new jobs or hire tech geeks like a pro.